We Bare Bears’s custom drink tumbler is a an excellent marketing idea for TV shows, movies and beverage companies. They did a great job partnering with movie theaters to give their program the boost it needs. 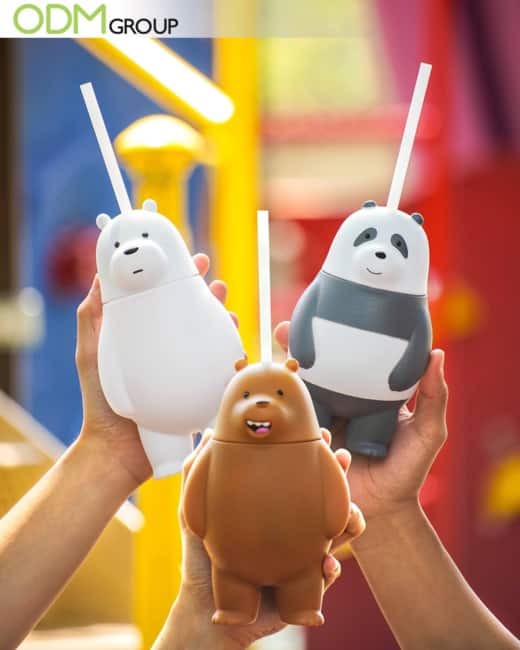 The tumblers feature We Bare Bears-inspired designs and moviegoers will get these cute tumblers when they buy snacks. Instead of using disposable plastic cups customers will be drinking from their unique drink tumblers. Because they are sturdy, they can still reuse them at home. Overall, we’d say that this is a brilliant marketing move from the show because these tumblers are remarkable and practical. This custom tumbler is the perfect drink container to take during parties or outdoor events because it basically screams We Bare Bears. Well, if you are a retail brand, you can easily showcase your logo and brand message through custom tumblers. Cute and portable, this bespoke branded tumbler is something your customers will be using to stay hydrated all throughout the day. OraCare’s tumbler is great because it is simple, affordable, and effective in promoting its line of products. Moreover, it’s practical so customers can use them for brushing their teeth, for gym, or travel, thereby extending brand visibility outside shopping stores. A promotional tumbler are cost-effective promotional products and there are so many different materials you can use- plastic, silicone and stainless steel. Marigold Malaysia offers a plastic tumbler to its customer and we love the branding on the container as it is very much recognizable. Moreover, it is a simple way to get their customers to purchase their milk. Complimentary Gifts with Purchase can affect shoppers’ buying decision because people are naturally drawn to free items. Plus, it serves as a great customer incentive. What Makes We Bare Bears’ Tumbler An Effective Promo Gift? Great Design and Customisation – As mentioned, the design is well thought out and was made with utmost quality. Having quality promotional items is paramount to the success of the marketing campaign. I mean, who would love to receive low-quality items? Low-quality items tend to end up in rubbish bins making your promotion a huge flop. Aside from We Bare Bears tumbler, here’s another good example of a great design made with quality materials. Aside from custom tumblers, brands can also use on pack promos, complimentary gift with purchase, and POS display to spice up your marketing projects! At ODM, our products designers will help you come up with ideas for your next promotional campaign hence you will always have support in your marketing journey. Please send us a message if you have any marketing and manufacturing queries. Our team will help you with all your design, sourcing, and manufacturing needs. Great custom tumbler idea from Nescafe. We love how the product provides the brand with a huge branding opportunities.